Boasting a slightly curved, contoured keyboard and a smooth, substantial mouse, the Logitech Wireless Wave Combo MK550 bundle could be just the thing for typists with aching wrists and tendons, provided you warm to the wave-like form factor. But while we like the included K350 keyboard’s roomy design, padded palm rest and array of programmable hotkeys, we’re disappointed by the cheap feel of the keys themselves, particular given the MK550 bundle’s $80 list price (we found it for only $45 on Amazon, though). And while the included mouse feels pleasingly hefty, lefties will be miffed by the righty-oriented button layout. In all, I counted 30 hotkeys on the K350 (assuming toggles count for two keys), 17 of which can be reprogrammed using Logitech’s aging SetPoint app. The newer, slicker Logitech Options utility works only with the mouse in the MK550 bundle—which, as we’ll soon see, comes equipped with its own impressive array of extra buttons. Both the MK550 keyboard and mouse connect to a PC via a wireless 2.4GHz USB dongle, which plugs in and works instantly without the need for drivers. The MK550’s wireless connection never dropped or sputtered during my testing, and both the keyboard and mouse quickly reconnected after going to sleep following periods of inactivity. While Logitech says the MK550 will work only with Windows PCs, the keyboard and mouse combo also connected to my iMac. Because there’s no Mac version of Logitech’s SetPoint software, however, Mac users won’t be able to customize the MK550’s hotkeys. Whether the MK550’s waved keyboard works for you will likely be a matter of taste. I found the contoured design to be a bit gimmicky and distracting, although I’d probably grow accustomed to it over time. That said, the slight curve in the overall keyboard shape does help keep your wrists at a straighter, more comfortable angle. Your experience with Logitech’s Comfort Wave Design may vary, so I’d urge you to try it in person to decide whether it’s a fit. As for the keys themselves, they’re disappointingly “meh” given the price of the keyboard. While the sculpted design of the keys make for easy discovery, the key caps feel a tad hollow and cheap, and there’s a fair amount of clickity-clack as you type. On the plus side, the MK550’s keys boast a solid, tactile bump in the middle of each keystroke, along with a decently springy rebound. The 4-ounce mouse that comes bundled in the MK550 package feels great, complete with a pleasing heft, rubberized grips, a smooth scroll wheel and a nice clicking action. In addition to doubling as a middle button, the scroll wheel can also be nudged left or right; by default, scrolling the active page left or right accordingly. Finally, you get two more side buttons, but only on the left side of the mouse, an annoyance for lefties. Each of the mouse’s buttons (including the left and right scroll wheel clicks) can be programmed via Logitech’s slick Options apps, which serves up functions ranging from switching apps and minimizing windows to launching programs or assigning keystrokes. You can even customize mouse gestures that trigger dozens of possible PC actions. Big, roomy, hotkey-happy and ergonomically minded, the Logitech Wireless Wave Combo MK550 could be just the ticket for Windows users whose aching fingers need a break. That said, we wish the loud keys on the MK550’s keyboard felt more substantial, while the included mouse is designed mainly with righties in mind. 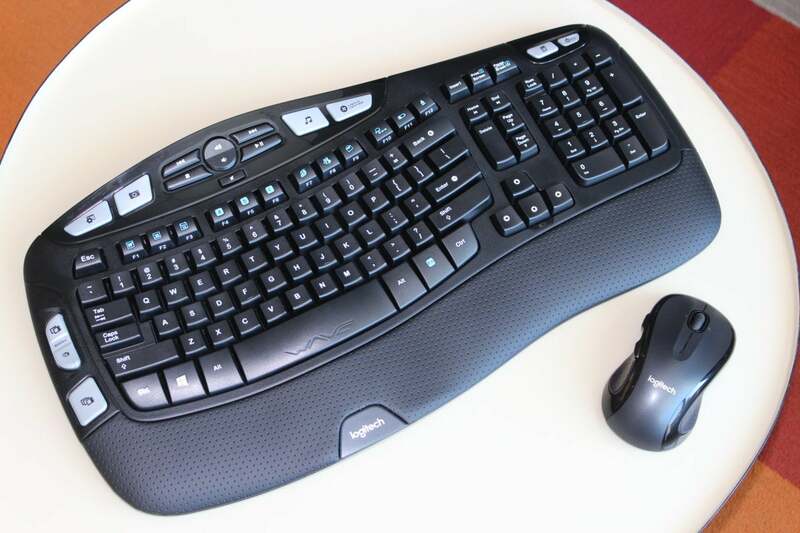 This story, "Logitech Wireless Wave Combo MK550 review: This ergonomic keyboard needs better keys" was originally published by PCWorld. Boasting a slightly curved, contoured keyboard and a smooth, substantial mouse, the Logitech Wireless Wave Combo MK550 could be just the thing for typists with aching wrists and tendons, provided you warm to the wave-like keyboard design.